YOU MIGHT GUESS that Falcon athletes constitute only a small minority of Seattle Pacific University students. And you’d be simultaneously right and wrong. One hundred and seventy-two athletes play varsity sports at SPU. That’s roughly 5 percent of the student body. But many more students participate in intramural sports — an informal but highly organized program that promotes friendly competition between individuals, small teams or entire residence floors. Seattle Pacific’s intramural program is one of the largest among small private universities, and student involvement hovers between 70 and 80 percent — one of the highest rates in the nation. Intramural and club sports are a longstanding tradition at SPU, going back almost to day one. The program’s enormous success, however, is a more recent phenomenon. “When I came in 1977, there weren’t many activities,” recalls Director of Intramural and Club Sports Howie Kellogg. “Just basketball, softball and football, and there were only five events in the entire Autumn Quarter. There was even talk of taking the program away from the Athletic Department.” But by offering more activities, Kellogg was able to raise interest and involvement almost immediately. Aside from the three years he spent in graduate school at the University of Minnesota, he’s been at SPU ever since. Along with the usual activities, like basketball, softball, volleyball and football, Kellogg offers some more obscure choices: badminton, bowling, chess, floor hocke y and pickleball (which drew record 64 teams last year). 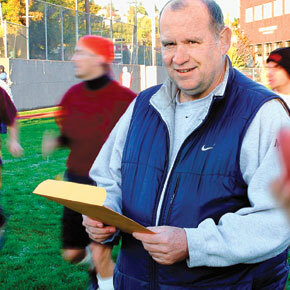 In fact, one obscure sport led to the SPU intramural program’s own 15 minutes of fame. The year was 1986, and the sport was Lazer Tag, a sort of high-tech paintball game. The Seattle Pacific team won second place in a nationwide tournament, garnering international media coverage — which, Kellogg chuckles, was the envy of his colleagues in the varsity sports programs. The team’s $4,000 prize went back into the intramural budget: Kellogg used it to buy floor hockey equipment. Never complacent, Kellogg constantly tries new approaches. One major change came about 10 years back, when he noticed that attitude problems were getting out of hand among some players. After comparing notes, Kellogg and other intramural directors devised a 10-point sportsmanship rating system. Now officials grade teams on their behavior during games, and teams have to maintain a rating of 7.0 to participate in tournaments. “We had a floor hockey team one time that was undefeated but didn’t make the playoffs,” he says.